We are so excited to offer Starlette "La Reine" by Sylvia Natterer. La Reine is a 44cm tall blonde haired vinyl doll. Starlette La Reine dll has blue painted eyes and wears a stunning costume. 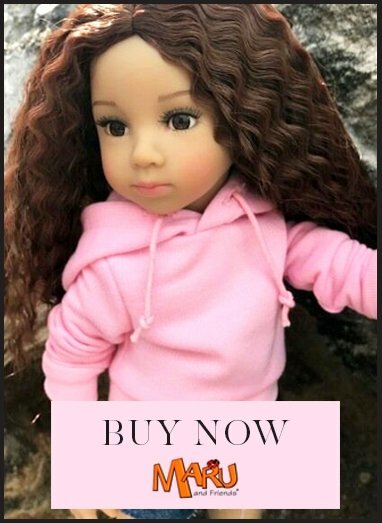 She is suitable for play for children of age 3 and over but also very popular with collectors who understand the beauty and value of having an artist sculpted and designed doll. Her face and eyes are painted in natural tones with peachy blushed cheeks and pinkish lips. Her body is vinyl and she has articulation at the shoulders, hips and neck. She has a lovely ability to stand and find poses which makes her wonderful for play and enjoyment. Starlette's hair is rooted into her scalp, durable and lovely and long for styling. The My Doll Best Friend hairbrush is excellent for detangling without damaging the hair. Extra clothes are available to fit Starlette, and she can share clothes and shoes with Finouche. Starlette La Reine is recommended for children from 5 years old.